Put up your dukes at Kirby’s Fight Club! Tape up your boxing gloves! 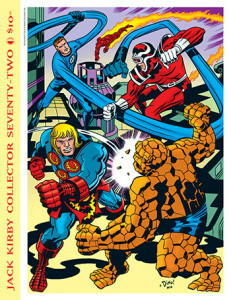 Jack Kirby Collector #72 ships today, showcasing Jack’s most powerful fights and in-your-face action! 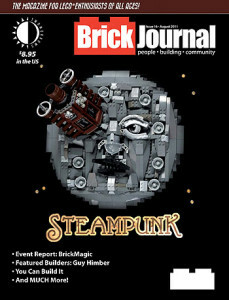 You can view a free preview and order at THIS LINK! This entry was posted in TNT on 31 August 2017 by Mr. Morrow. Kirby100 is finally here! Get your copy now! It’s finally August 28, so today TwoMorrows and the Jack Kirby Collector magazine celebrate Jack Kirby’s 100th birthday in style with the release of Kirby100, a full-color visual holiday for the King of comics! It features an all-star line-up of 100 comics pros who critique key images from Kirby’s 50-year career, admiring his page layouts, dramatics, and storytelling skills, and lovingly reminiscing about their favorite characters and stories. Featured are Bruce Timm, Alex Ross, Drew Friedman, Walter Simonson, John Byrne, Joe Sinnott, Steve Rude, Adam Hughes, Wendy Pini, John Romita Sr., Dave Gibbons, P. Craig Russell, and dozens more of the top names in comics. Their essays serve to honor Jack’s place in comics history, and prove (as if there’s any doubt) that Kirby is King! This double-length book is edited by John Morrow and Jon B. Cooke, with a Kirby cover inked by Mike Royer. You can view a free preview and order HERE! This entry was posted in TNT on 27 August 2017 by Mr. Morrow. This entry was posted in TNT on 23 August 2017 by Mr. Morrow. 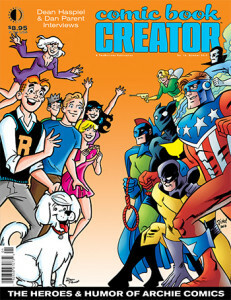 Missing comic shop copies of Back Issue #99, Alter Ego #148, and Comic Book Creator #15 found! After much detective work, we’ve finally tracked down Diamond’s missing copies of our three newest mags: Back Issue #99, Alter Ego #148, and Comic Book Creator #15. If your local comics shop didn’t get their full order of any of these issues, they should have their missing copies within approximately a week. Now that we know they’re on the way to retailers, we’ll go ahead and activate the digital edition of each one tomorrow (Wednesday). Thanks to everyone for your patience! This entry was posted in TNT on 15 August 2017 by Mr. Morrow. WARNING! Reed Crandall and Kirby100 Hardcover sellouts! Don’t wait! As we’ve been warning customers for weeks, the Limited HARDCOVER Edition of our KIRBY100 book has now completely SOLD OUT, well before its official release date on Jack Kirby’s birthday, Aug. 28. However, the SOFTCOVER is still available, so don’t delay ordering! And if you still haven’t ordered our new Hardcover biography of comics great REED CRANDALL, we are down to just a few copies left! We will NOT be reprinting the Hardcover, so get yours now, or it’ll be gone too! This entry was posted in TNT on 10 August 2017 by Mr. Morrow. 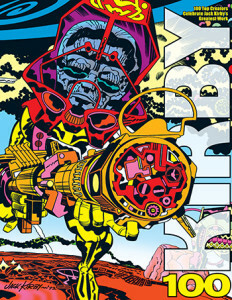 Celebrate Jack Kirby’s 100th birthday with Kirby100 and TJKC #72! The party starts here! TwoMorrows and the Jack Kirby Collector magazine celebrate Jack Kirby’s 100th birthday in style with the release of Kirby100, a full-color visual holiday for the King of comics! It features an all-star line-up of 100 comics pros who critique key images from Kirby’s 50-year career, admiring his page layouts, dramatics, and storytelling skills, and lovingly reminiscing about their favorite characters and stories. Featured are Bruce Timm, Alex Ross, Drew Friedman, Walter Simonson, John Byrne, Joe Sinnott, Steve Rude, Adam Hughes, Wendy Pini, John Romita Sr., Dave Gibbons, P. Craig Russell, and dozens more of the top names in comics. Their essays serve to honor Jack’s place in comics history, and prove (as if there’s any doubt) that Kirby is King! This double-length book is edited by John Morrow and Jon B. Cooke, with a Kirby cover inked by Mike Royer. Then tape up your boxing gloves, as Jack Kirby Collector #72 (100 full-color pages, $10.95) takes you to Kirby’s Fight Club, showcasing Jack’s most powerful fights and in-your-face action! We’ve got recollections of real-life war experiences by Jack and his contemporaries from the Greatest Generation, Kirby’s quick-trigger work on Marvel’s kid cowboys, the Madbomb saga and all those negative 1970s Marvel fan letters, an interview with Scott McCloud on his Kirby-inspired punchfest Destroy! !, a rare Kirby interview, the 2017 WonderCon Kirby Panel, Mark Evanier, unpublished pencil art galleries, and more! Cover inked by Dean Haspiel! Edited by John Morrow. Both will be in stores Wednesday, August 30, and ships directly from TwoMorrows on August 28. This entry was posted in TNT on 3 August 2017 by Mr. Morrow. IN PREVIEWS NOW: Back Issue #101, Comic Book Creator #16, Draw #34, & more! 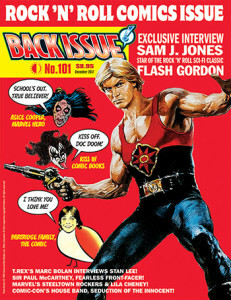 BACK ISSUE #101 – NEW! Showcases ROCK ’N’ ROLL COMICS! COMIC BOOK CREATOR #16 – NEW! Archie Comics spotlight, with DEAN HASPIEL & DAN PARENT! 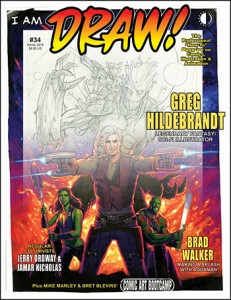 Demo & interview with GREG HILDEBRANDT! TwoMorrows’ REED CRANDALL biography is now shipping! From the 1940s to the ’70s, Reed Crandall brought a unique and masterful style to American comic art. Using an illustrator’s approach on everything he touched, Crandall gained a reputation as the “artist’s artist” through his skillful interpretations of Golden Age super-heroes Doll Man, The Ray, and Blackhawk (his signature character); horror and sci-fi for the legendary EC Comics line; Warren Publishing’s Creepy, Eerie, and Blazing Combat; the THUNDER Agents and Edgar Rice Burroughs characters; and even Flash Gordon for King Features. 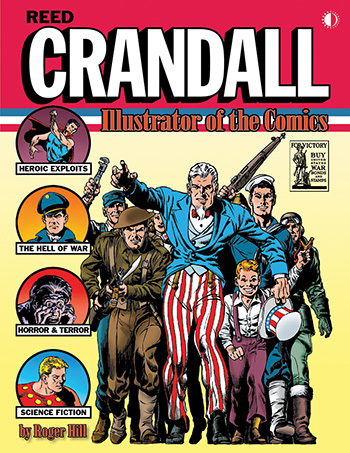 Comic art historian Roger Hill has compiled a complete and extensive history of Crandall’s life and career, from his early years and major successes, through his tragic decline and passing in 1982. This full-color hardcover includes never-before-seen photos, a wealth of rare and unpublished artwork, and over eighty thousand words of insight into one of the true illustrators of the comics. 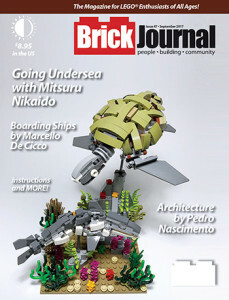 You can see a preview of it and order HERE! This entry was posted in TNT on 2 August 2017 by Mr. Morrow.